Doctors Don't Know What Women Want To Know About Birth Control : Shots - Health News Doctors tend to think it's most important to discuss how to use contraceptives and whether they're effective, a survey found. But women care more about safety and side effects. Doctors tend to think it's most important to discuss how to use contraceptives and which methods are most effective at preventing pregnancy, according to the poll, which was published in the journal Contraception. 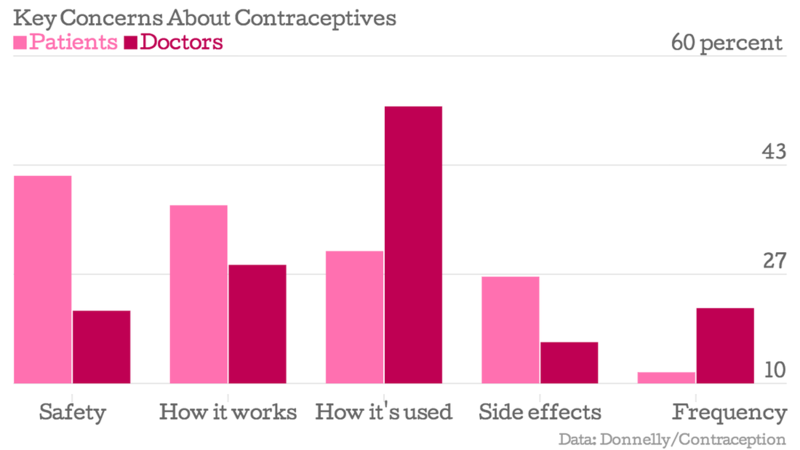 Women, on the other hand, are often more concerned about safety, side effects and how the contraceptives work. Those considering permanent contraceptive option may be worried about safety as well. Recently, the safety of Essure, a device that's permanently inserted into the fallopian tubes to block them, came under question when a number of women who used it complained about pain, hemorrhaging and headaches. "The main takeaway is really that it's very important for providers to speak about what's most important to women," says Kyla Donnelly, a reproductive health researcher at the Dartmouth's Institute for Health Policy and Clinical Practice, who led the study. Yet providers don't always know what what's most important to their patients, she tells Shots. "And doctors are increasingly having to manage very short consultation periods." These results aren't the final word — the participants were mostly white, and they had to have Internet access in order to complete the survey. But it does show that doctors and patients aren't always on the same page. Donnelly says she's working with other researchers to developing guides — called option grids — to help health care providers and patients discuss contraceptives. "That way providers can feel supported with the right information."